Last weekend, before the anniversary party, we spent a day in New Westminster, part of Greater Vancouver, BC. The town stretches along the Fraser River, and continues to be an important shipping port. The north side of the riverfront has been revitalized; a long walkway extends beside the water, with pretty housing, flower beds and baskets, and lots of bird life. Above you can see a heron, the walkway, a CPR train (we had to cross the tracks to get from our hotel to the town), a tea shop in River Market, and a fence of lovers' locks. A very tall tin soldier stands guard over the children's play area. In 1859, New Westminster became the capital of British Columbia, a short-lived honour once the Island joined the province and the capital moved to Victoria. The city was named by Queen Victoria for her favourite part of London - Westminster. One of the gardens planted along the walkway, with the river in the background. I recently discovered a Canadian connection to Highclere Castle, the film location of Downton Abbey. The 4th Earl of Carnarvon served Queen Victoria as Colonial Secretary and aided in the passing of the British North America Act in 1867 that created the country of Canada. In helping construct the Act, Lord Carnarvon wanted to see the Senate have a limited tenure, in place of the "for life" status others argued for. I wish he had persevered. Our first prime minister, Sir John A. MacDonald, was a guest at Highclere and wrote that it was "one of the swellest places in England." So it tickled my fancy to find a street in New Westminster named Carnarvon, named for the Lord of Highclere Castle. Some of this information I discovered on Lady Carnarvon's blog, and more from history sites. Linking with Mosaic Monday (on hiatus until September after this week), hosted by Maggie of Normandy Life. New Westminster looks like a beautiful place to visit, the Highclere/Downton connection is fascinating. Do you have Lady Almira's book? Happy Mosaic Monday, see you in September! 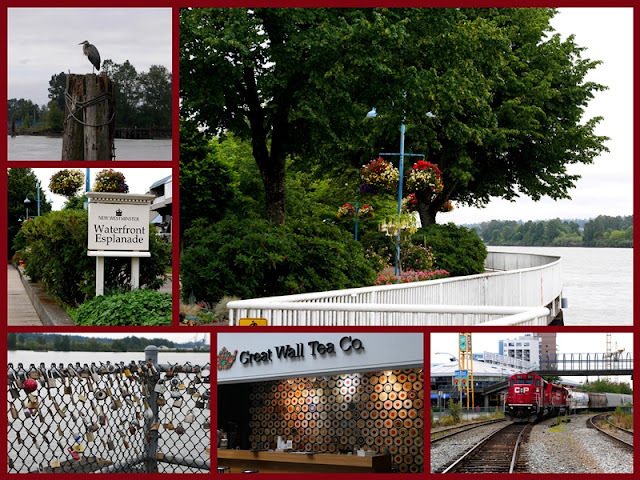 I always love exploring port cities ... there's just something magic about them.... New Westminster is lovely! And fun to learn of the connection to the real Downton Abbey. I read the book by Lady Carnavon but did not know about the blog. What a lovely area. The tin solider is quite something isn't it! New Westminster is lovely. I think port areas are fascinating. So nice that Westminster is taking care of the area and making it fun for everyone. Fun connection to Highclere. I love research! :) Happy Monday! Amazing places like that are what makes an area shine. I love your blog---why haven't I been here before??? So I scrolled through--wonderful. Lorrie, Very nice post with interesting information. Not heard of the tea company in your post. I will have to research it. Thanks for sharing and have a great week. Sylvia D.
it looks like a wonderful place to walk with such lovely gardens. My eyes naturally gravitated to the Great Wall Tea Co. on your mosaic. Very cool! What a fun connection to Highclere Castle. Yes, I noticed the Great Wall Tea Company too. What a lovely place to visit. Loved reading the connection to Highclere Castle too. Thank you for visiting my blog Lorrie. Nice to meet a fellow BC blogger. Pretty photos Lorrie. Wishing you a beautiful & sunny August! Beautiful tour of the city. I like that tall thin soldier. Lorrie - I am always delighted to hear about cities that are re-vitalizing waterfronts - what is it about water that pulls us so? And the Carnarvon Connection - if I didn't know better, I would think it was a spy novel! You 'paint' a lovely picture of New Westminster, both with photos and with words. Lots of history there. 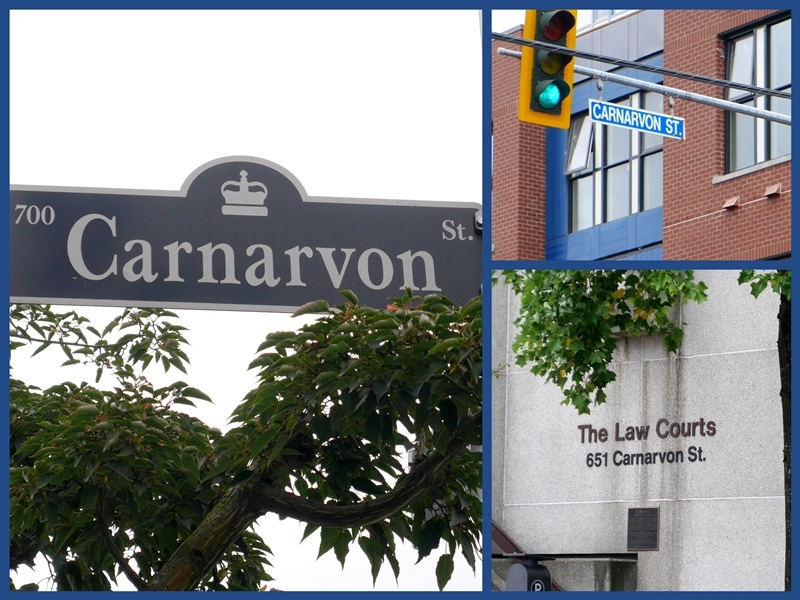 New Westminster looks lovely and what a fun surprise to find the connection to Lord Carnarvon there! I like the giant tin soldier statue, The "Steadfast Tin Soldier" is one of my favorite Hans Christian Anderson fairy tales. What a nice place. Fun that it has that connection to Highclere! Love, love, love Vancouver and any new pix are always exciting to view. Thanks for these Lorrie - hopefully I'll come that way again some day, sooner rather than later!